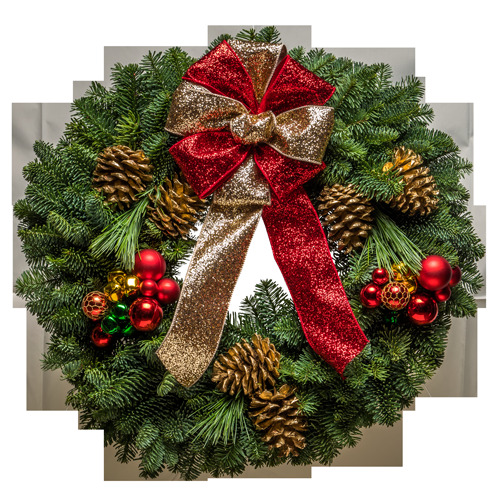 Dazzle every guest during the holidays with this classic Christmas wreath in traditional green and red. The fresh evergreens, the delicately embossed bow and shimmering red ornaments make this a wreath that will fill any home with all of the dazzle, pizzazz and sheer delights of Christmastime! "I just wanted to take the time to let you know how pleased we have always been with your product. Ordering is a breeze and delivery is extremely efficient. In particular, I have a very special client to whom I send a wreath every year. This year, I visited their office in November and they still had their wreath from the previous year hanging.! It had a dried flower arrangement look to it, but was still attractive and believe it or not it still had a vague 'pine scent.' Just thought I would pass it along�Good job and thank you!"